Most human resources managers have stories of new employees that fell through because they got better offers, or because they got cold feet and decided to run off at the last minute. For most new employees, the first day can be exhausting. It’s important to initiate and maintain communication, so your new hire doesn’t become the “one that got away”. Your welcome letter will say a lot about the personality of your company. For an elegant and formal touch, you could include a personalized message from the CEO. Alternatively, if you want to reflect a more fun and youthful vibe, you could enlist the help of the entire team to create humorous one-liners. The options are endless, so feel free to get creative. When choosing items to include in your kit, think about your employee’s day. Try to think of things they’ll likely use. A company mug, for example, is something they’ll appreciate. It’s likely that they enjoy drinking coffee, because who doesn’t? But if they’re on a caffeine-free diet, they can still use a mug for other beverages. No welcome kit is complete without company pens. They’re easy-to-order and cost-effective. With so many thoughts on your new hire’s minds, a pen is needed for those moments when inspiration strikes and their electronic devices fail them. Company notebooks are an all-around favorite. They’re useful for jotting notes related to both personal and professional affairs. They also create a professional business image for your company. Make it official! Welcome your new hires to the team by giving them custom T-shirts. Just like in sports, a uniform inspires teamwork and camaraderie. Plus, company shirts are an effective way to create a cohesive, polished, and professional look for your staff. Staff profiles help your new hire get to know their new team members. When you meet ten to twenty people in one day, it’s hard to keep track of names and faces. In addition to contact details, employee profiles should also include areas of interest and hobbies. Your new hire will feel more comfortable if they already have something in common to talk about with their colleagues. How far can a simple “thank you” go? Clients are more likely to remember you if they experience regular acts of gratitude. Thanking clients is not just considered as polite behavior. It is a way to build a lasting relationship, and there’s no better time to show appreciation than during Christmas. The holidays mark the end of another year, and is often a time for reflection. Can you afford for your clients to reflect only to realize they want to switch to one of your competitors? No? Then perhaps a Christmas gift is in order. Try these five thoughtful ways to show how much you appreciate your clients. It may be old fashioned, but what better way is there to show clients how much you care than with a simple thank you note? When crafting your message, try to be focused and personal. Try to find a specific way your client has made a meaningful impact on your business. It will make your note more personal and will likely increase motivation to work with you again. Get a customized company greeting card printed out, write a short message inside, and attach it to a bouquet of flowers. Useful and creative promotional products are a great way to thank clients. The best way to determine out-of-the-box ideas is to think of what would really impress you. Branded products go way beyond customized pens. It’s especially helpful if you know your clients’ interests and are able to match some really nice personalized gift sets to those interests. 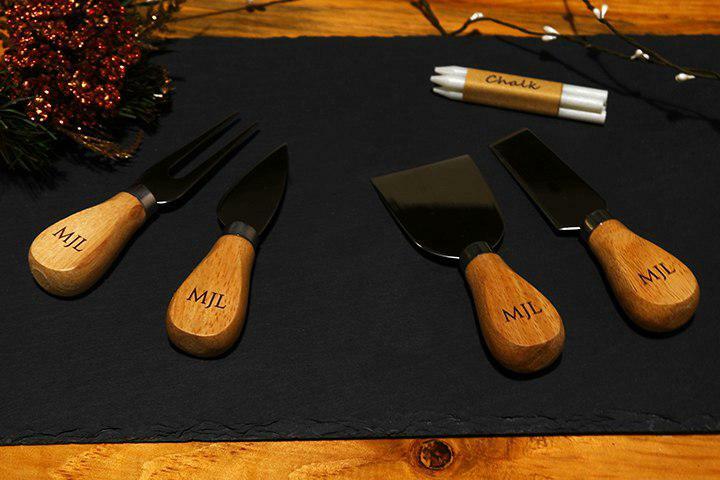 If you have clients who love fine dining, a cheese knives set is the perfect gift. They’ll appreciate that you went the extra mile to make them feel special. Are your clients always on the go? Customizing travel items is always a nice choice. Give them toiletry bags they can use immediately. Select canvas, leather, or waterproof options for a bag they’ll love forever. Also, portable phone chargers or charging docks make crowd-pleasing gifts for frequent travelers. Your clients will thank you when they’re unable to get to a wall or car charger. Like most business professionals, your clients likely do a great deal of notetaking. Have nice leather-bound notebooks created in your company colors or with a subtle logo printed on the front cover. A custom notebook is the perfect gift for clients who want to keep up with the notes they capture day-in and day-out. The best way to wrap up a great year with your clients is with customized calendars. From desk calendars to portable pocket planners, there are many options that your clients will love. Your logo and contact information will be seen by your clients daily. It’s a great way to put you on top of your client’s mind for the year to come.